This is where I set myself up to get killed. However, I'll wade once again into the VP speculation maelstrom to make a few comments about what is currently happening. For the record, I've moved beyond the "who" of the veepstakes at this point. Sure, it's consequential, but in my mind the timing issue is much more fascinating right now...if only because all the possibilities have been talked to death. I don't want to totally rehash my post from last week, but I do want to reprise it. 1) The VP decisions are on the horizon. 2) Obama is expected to be the first to move since the Democrats hold their convention first (However, FHQ should note that this hasn't been a year for following traditions in presidential politics.). 3) There is now a week until the Olympics kick off a four week smorgasbord of sport and politics (two weeks of each and in that order). 4) The pundits know, or think they know, that the prospective VP lists are shrinking and who is supposedly on them. What does my gut tell me about when these announcements will be made? 1) All the talk from the Obama camp about the decision being weeks away is a hoax. I don't buy that, but it is clever of them, not to mention convenient to say the trip abroad delayed those efforts. I still feel like the decision will be made prior to the Olympics and that means next week. 2) Well, it won't be on a Friday (or over the weekend). Friday is a day to release your medical records or some other news you'd like buried. That eliminates tomorrow and next Friday. Next Friday is out anyway because that's when the Olympics begin. 3) An announcement won't be made late in the work week next week. [Define late, FHQ.] By late I mean after Tuesday. The goal of a VP announcement is to time it in a way that maximizes the free air time you get out of it. The earlier in the week the better then. I would add the caveat that they wouldn't want to announce too early lest there be a backlash of some variety. However, the Olympics will be there to wrest attention away at the end of the week anyway. All this has assumed that Obama will be the one to go first. And for him to maximize the attention coming out of that announcement (not to mention put McCain in a tough position -- having to potentially announce during the games), making the move Monday or Tuesday of next week would probably suffice. And hey, you know what? Monday happens to be Obama's birthday. [Well, you lost all] credibility there.] Before you dismiss that notion, it should be pointed out that the Democrats are big on coincidental synchronicity in this election year. Obama will accept the nomination on the anniversary of MLK's "I have a dream speech." Hillary Clinton, it has been reported, will speak on Tuesday night which happens to also be the anniversary of the ratification of the 19th amendment. No, Obama's birthday isn't as big as either of those events, but it is an interesting side note to make...even if only for coincidental synchronicity. The question is: How consequential is that? Is that enough to swing the election to McCain or are those Democrats concentrated in comfortably red states already? I don't have an answer, but I would like to open the topic up for discussion. These numbers are based on the current Rasmussen national poll that was released under the somewhat misleading (yet more eye-opening) headline, "30% of Conservative Democrats Say They'll Vote for McCain." That's great, but only 18% of those Democrats polled in the two weeks the survey was conducted said they were conservative. The release goes on to list the numbers broken down by age and race, but not by region or by state. Now, I'm sure that information is available via subscription, but I'm not privy that information (Perhaps some of our readers are.). But what do you think? Is 5% enough to hurt Obama? It is certainly better than the 28% of Hillary supporters who said they'd vote for McCain back in March (if Obama became the nominee). These numbers don't stray too terribly far from the established averages in North Carolina and Washington. The Pennsylvania result, though it is outside of where our weighted average has the state currently, is within one standard deviation of the average and is consistent with the direction polling has gone in the Keystone state of late. With only three polls, though, the chances of having any change -- significant or otherwise -- to the electoral college map are slim. And that happens to be the case: there were no changes to the map. However, that gives us an opportunity to unveil a new feature to these posts. 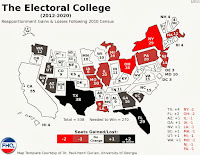 Our discussion on Sunday of where South Carolina ranks on Obama's list of states to potentially pick off from McCain (and Paul's response) got us to thinking about ways that we could show the current balance within the electoral college projection. It is one thing to show this on a map, but the goal is differentiate between even the states within one category, not simply across categories. The Watch List gives some indication of this, but the graphic below is logical stepping stone from the map to that list. So, though Obama's 278-260 electoral vote advantage remains unchanged from Sunday we have this new graphic to help us better understand the state of play in the race for the White House. * Pennsylvania is the state where Obama crosses (or McCain would cross) the 270 electoral vote threshold to win the presidential election. Let me explain what you see. Basically, this is a fleshed out version of what I posted in response to Paul the other day. The five columns align the states from the most Democratic to the most conservative, working from top to bottom and left to right. Hawaii, in the top left corner, is the state most heavily for Obama at the moment and Utah is its counterpart on the other end of the spectrum, favoring McCain. The color scheme from the map is the same, so we can see that when light blue switches to pink, the states thereafter begin shifting toward McCain, increasing in their intensity of support for the Arizona senator as they move toward that lower right corner. For example then, the color change tells us that Alaska more strongly favors McCain than Florida, but that within the Toss Up category, Florida is a more solid McCain state than North Carolina. You'll also see Pennsylvania is shaded in yellow. Pennsylvania may not have this distinction in the future, but a state shaded yellow denotes the state that puts or would put either of the candidates over the top in the electoral college. The Keystone state is among the 23 states (and the Distict of Columbia -- which is excluded for aesthetic purposes and because it will undoubtedly go for Obama in November.) that comprise Obama's current electoral college coalition. In fact, it ranks 22, which would mean that McCain would have to change his fortures in Nevada and Pennsylvania to get to 270. The new graphic enhances The Watch List. We can see that, for example, Washington (the only new addition to the list today) is close to potentially shifting from a strong Obama state to merely leaning toward the Illinois senator. But we also know that, in conjunction the two figures add yet another line of gradation to our discussion, between states that are comfortably within one category and those likely to change with new polling. That adds some complexity to our discussions, but at the same time provides everyone with a bit more information on how things are progressing in the race. Note: You'll notice that I annoyingly referred to the new graphic as "the new graphic" way to many times. Yes, there's a name atop that addition, but I'm not necessarily sold on permanently calling it The Electoral College State Rankings (too long and probably too boring). Obviously the Tipping Point is being used, and even though that isn't proprietary, it has been overused over the years in these sort of analyses (Plus, you never want to seem like a copycat.). So I'm open to suggestions about what to call not only the entire thing, but the state where the 270 threshold is crossed. If you have any thoughts, the comments section awaits. I'm not one to rehash stories (Well, not without putting my own spin on them first. ), but this one is too good not to comment on. Yesterday the Republican National Committee revealed that it would be going online with a Facebook parody of the presumptive Democratic nominee for president called BarackBook. The social networking mashup had "friends" of Obama's like Tony Rezko and William Ayers in addtion to sporting commenting features and an application that could be used on the actual Facebook. At the time I thought, well, this is an interesting way to point out associations Obama may like to keep out of the limelight. But I also thought that actual friends of Obama could enter the site. Obama apparently has a few friends (and some enemies as well) and several of them appear to be pretty savvy. The site went live yesterday, but saw its first day of scrutiny today, and the result was a mixture of participation from members of the liberal blogosphere on the one hand and racist/anti-Muslim comments on the other. A good day for the site and for comic irony. Which brings me to my question: Is the internet an advantage for the Democrats? Usually, you expect to see the Democrats trying to match wits with the Republican and looking foolish in the process. In politics it seems, imitation is not necessarily the sincerest form of flattery. Often it just looks lame and costs the candidate/party responding credibility points. Recent electoral history is chock full of examples of Republicans pulling the proverbial fast one on the Democrats. John Kerry windsurfing or Michael Dukakis in the tank or Jimmy Carter having nothing to say to "There you go again" come to mind. But that is the mark of this era: the Democrats typically had no adequate response. And honestly, that was partly because of ineptitude and partly because of disciplined, well-run campaign strategy on the other side. It was just fantastic politics. But I'm beginning to wonder if new online echo chamber has reversed those roles and in the process made the talk radio echo chamber antiquated. The current electoral environment is certainly tilted in favor of the Democratic Party, so that biases this observation to some extent because the GOP is on the defensive. However, have the Democrats got such an advantage online that they are the aggressors on this sort of thing now? Yes and no. Liberal bloggers definitely have a leg up on their conservative counterparts, but McCain and his campaign (in conjunction with the national party) just haven't had the type of disciplined campaign that we are used to seeing from the Republicans. There are hints of it, but it hasn't been carried out in that awesomely calculated fashion that is the calling card of the conservative strategists. It is almost as if, even though McCain is probably the best general election candidate the Republican Party could have fielded for this particular election, they don't know quite what to do with the Arizona senator. Like he just isn't one of them. And that combination has certainly hurt McCain in some cases during this summer leg of this campaign. All the same though, the perceived Democratic advantage online isn't being coordinated by the national party in the way the GOP maneuvers of this sort have been in the past. This is a totally organic response from the masses. That underscores the differences in the two parties: the top down management style of the GOP and the bottom up populism of the Democrats. In the case of the latter it is out of the control of the national party and the Obama campaign. So while it can help, it has the potential to be harmful as well since it is not necessarily a series of coordinated actions with the party/candidate. That can pull the direction of the candidate's message off course and potentially change the narrative of the race though. Away from where the candidate may want to take it. That is where the potential for danger lies for Democrats seeking office or online. So while Obama has successfully reigned in the activities of some outside groups, as far as 527-type ads are concerned, he still potentially faces a hurdle from his online supporters. Will there be a continued role reversal during this cycle and into the future or will online efforts haunt Obama at some point. That, my friends, will be something to keep our eyes on. And here you thought, presidential primary (and caucus) frontloading was off the agenda until, say, 2011. No, as I mentioned in the initial installment of the "Frontloading Under Fire" series [Yeah, I didn't know there would be other ones either. But I opted to rehash the title instead of coming up with something snappy or forcing something boring. ], frontloading in 2012 is very much on the agenda these days. The GOP are forced to confront the issue now -- as in, at their convention -- because they can only debate and make such rule-changing decisions from within the confines of the convention. The Ohio Plan (see a discussion of it and other reform plans in the right hand sidebar)that the Republicans are forwarding would grant Iowa and New Hampshire their customary positions at the front of the line with a series of small state contests to follow. The remaining, bigger states would be split into three groups with each group holding contests a few weeks apart (after the small states). We are just a few weeks off from the GOP convention, so one piece of the 2012 puzzle will be in place then. Another piece of that puzzle is the potential for a regional primary system. The one proposed by the National Association of Secretaries of State received some attention this past weekend as the group met in Grand Rapids, MI for its annual summer meeting. Given what transpired in Michigan during primary season, Grand Rapids was an interesting location for the meeting. Really, all that came out of the meeting in regard to the primary system was that NASS was still in favor of the rotating regional primary. But hey, it was in the news (...buried under all that McCain and Obama talk and perhaps some other stories as well.). I bring the Ohio Plan and the regional primary plan up together because I only really take the former seriously. Why? Well, the national parties are more likely to have some say in the issue than even this bipartisan collection of secretaries of state. The ball has always been in the parties' court on this issue. The decision is made based on the interaction between state parties/legislatures and the national parties. The national parties set the rules and the state-level actors operate under them. Secretaries of state work independent of that relationship unless, of course, you are talking about New Hampshire, where it is the secretary of state and not the state parties/legislatures making the decision. The drawn-out contest for the Democratic presidential nomination in 2008 may temporarily mitigate but is not likely permanently to end pressure to halt or reverse the front-loading of presidential primaries and caucuses, including pressure for action by Congress. In this essay, written for publication in a forthcoming Brookings volume, REFORMING THE NOMINATION PROCESS edited by Steven S. Smith and Melanie J. Springer, I take no position on the desirability of reform, other than to support a ban on nominating events prior to a specified date in February or early March. Rather, the essay concentrates on congressional power to regulate the timing of nominating events. I argue that some commentators have underestimated the structural arguments against any implied power by Congress to regulate presidential nominations. However, relying on the 12th Amendment, I come to the same conclusion as most commentators, that Congress does have the implied power. With respect to possible limitations on Congress' power deriving from the parties' associational rights, it is necessary to consider who the likely complainants will be. The most likely entities to object to congressional regulation are state governments and state parties. But the former have no first amendment rights against congressional action and the latter's claims would be quite weak. National parties could have stronger constitutional grounds for objecting to congressional regulation, though it is far from clear that they would prevail. More importantly, the prospects for congressional action are not particularly great in any event and the chances that Congress would act over the strenuous objection of one or both major parties are remote. Regulation is not unconstitutional on associational grounds unless the affected association objects. Therefore, whatever the national parties' theoretical associational rights may be, there is little likelihood Congress will regulate in an unconstitutional manner. In a brief final section, I suggest that despite the probable constitutionality of congressional regulation, substantive regulation is undesirable, with the possible exception of setting a starting date. If Congress feels under political pressure to do something more, it would be better advised to facilitate joint deliberation and negotiation by the two major parties and to assist them in enforcing their own rules against the state than to impose a mandatory system on the parties and states. Needless to say, I'll be lined up outside the bookstore for that one when the time comes for its release. More to the point, though, that adds some insight to the reform discussion we've been having here. Congress does have the ability (and likely the upper hand in court) should it decide to wade into the issue of scheduling presidential nominating events. However, normatively (at least in Lowenstein's eyes) that may not be the preferred route to reform. ...unless it includes his earlier capping of when states can actually hold their contests. The battle lines seem to have been drawn in Virginia in the race for the White House as Monday the commonwealth's GOP chairman added a new twist to the story of record Democratic registration in the Old Dominion and across the nation. Jeffrey Frederick accused the Obama campaign and local canvassing organizations of colluding to register new minority voters in Virginia and in some cases to do so fraudulently. His claims were based on the arrests last week of three canvassers accused of submitting fraudulent registration forms in the Hampton area of Virginia. Now, this sort of accusation isn't new. However, Frederick added that voters -- or potential voters in this case -- should steer clear of canvassers because of the potential for identity theft. Identity theft?!? Really? Of course, Democrats in the state were quick to counter Frederick's opening salvo with the old standby accusation that minority vote supprssion was Frederick and GOP's aim. This appears a fascinating development until it is recalled that Virginia was a member of the confederacy and no stranger to racial tensions in the electoral arena. Honestly, this is simply an extension of the back and forth between Democrats and Republicans in the state during the 2006 midterm elections. That George Allen/Jim Webb race for the senate was never lacking in racial cues; from Allen's "macaca" slur to the accusation that Webb had used the N-word. The addition of the identity theft angle, though, is a clever one meant to subliminally seep into the electorate's consciousness in a way similar to the way Obama's recent trip overseas has been purported to have advanced the idea of Obama as acting president. But again, this is a logical extension to what we have seen during recent electoral cycles. Frederick's comments cannot neceessarily be equated to the efforts of fictitious groups to caution minority voters that even minor legal infractions disqualify voting, but in the minds of Democrats, they operate on the same plane. That those events (see link above) occurred in Wisconsin, a swing state in its own right recently, furthers the idea that Virginia is, indeed, a closely contested battleground for this cycle. And it is, surprisingly or not. The demographics in the state have certainly shifted with the African American voting bloc coalescing with a growing Democratic bastion in Northern Virginia to pull the state toward Democrats; toward the Democrats and into the purple. And in a competitive environment, the onus is on the parties to find potential voters to swing the state in one direction or another. That's about the time voter fraud accusations start to fly. Related: FiveThirtyEight on the Tim Kaine as VP speculation. Just as a refresher, the premise of the caucus question is that there is movement in the level of support for a candidate throughout the steps of caucusing. Factors that intervene are how early the original contest was, how many steps -- and thus opportunities for delegate support to shift -- were there in the caucus process, and how many candidates competed. In most years during the frontloaded campaign era, it is fair to say that with nominations clinched early, competition dropped, making it a foregone conclusion that the front-runner/presumptive nominee would gain as the process progressed. With the Clinton-Obama contest stretching to the last days of actual contests in 2008, there was a natural opportunity to see if, in fact, there was anything to this caucus question idea. With Iowa and Nebraska, you have two states on opposite ends of the spectrum. Iowa had the earliest contest; one that was competitive to say the least. And the near equal distribution of the vote between Clinton, Edwards and Obama demonstrated that. In Nebraska, Edwards had already dropped out and Obama had apparently laid the grassroots foundation in a caucus state that would, collectively with the other caucus states, prove the cornerstone of his successful nomination run. In other words, Nebraska was not as competitive as Iowa. In Iowa, then, there was room for improvement for Obama. In Nebraska, on the other hand, any gains would have been hard to come by for Obama or Clinton. The battle for gains in Iowa, though, centered on John Edwards' delegates and most moved over to Obama. The others opted to stick to their guns and continue to back Edwards instead of moving toward Clinton. So, while initial estimates had the delegate breakdown in Iowa pegged at a 16-15-14 Obama/Edwards/Clinton split, Obama ultimately ended up with a 32-4-9 distribution of pledged delegates heading to Denver next month. In Nebraska, the story was slightly different. Obama won the post-Super Tuesday caucus in the Cornhusker state handily, but had nowhere to go. Even after having clinched the nomination, a total consolidation of Nebraska's delegates didn't happen for Obama as it might have in a less competitive enironment. Clinton was able to improve based on her delegate numbers rounding up at the state convention in two of Nebraska's three congressional districts as well as in the statewide tally. What emerges from this tale of two states are three possible options: 1) a move toward Obama, 2) a move toward Clinton and 3) no movement at all. Iowa, we can pencil in as a gain for Obama, and Nebraska most resembles the no movement group of caucus states. *The delegate decisions in the Hawaii process were determined by the first step. The decisions made at the Hawaii state convention were bound by the precinct caucus decisions. The Aloha state was prevented from exhibiting any movement. **Texas defies any of these characterizations. Initially the movement from the first to second step was toward Obama. From that point to the state convention, though, some support drifted back toward Clinton. That the environment was so close had much to do with the overall lack of movement that we saw throughout the various caucus processes. In a "normal" cycle, the front-runner/presumptive nominee would have been able to peel off most, if not all, of the opposing delegates. But that has a lot to do with the amount of space between first and second place. There was barely any light between Clinton and Obama. That had the effect, in most states, of causing Clinton delegates to stay true to who they backed in the first place. And that is the story of this historic nomination race: that it was so close. That competitiveness overwhelmed the possibility of seeing any variation in the delegate movement based on how early a state held its caucus or how many steps a particular state's caucus process contained. Note: If I can get a hold of the GOP data for comparison, I'll revisit this. That data though has been difficult to come (and the reason there hasn't been a Republican series of caucus question posts.). We documented earlier this week that there may be a problem with Rasmussen's decision to report two different polling results with each release and have everyone use the newer and different, "with leaners" data when reporting it secondhand or using them in an electoral college analysis. Comparing a poll from Georgia in June that had no inclusion of leaners with a poll from July that did is problematic at the very least. Below is an updated look at the polls that Rasmussen has released since the "with leaners" distinction began appearing in press releases following July 4. *The "with leaners" distinction was added to reports that were released beginning on 7/9/08. The date on which these polls were conducted (The ones that these releases were based on) stretches back to 7/7/08. **Rasmussen has only conducted one poll in these states. Therefore, the difference was taken from between the with and without leaner numbers within the same poll in these cases. ***Previous poll had been taken after "with leaners" change had been made. Overall then, there is still a bias toward McCain in cases where "with leaners" data is replacing w the data that does not include them. 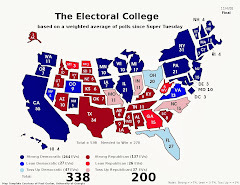 As I've said, this isn't going to hae major ramifications at the outset, but over time, once a series of polls have been conducted, that collective difference could have a huge impact on what FHQ and others are doing with their electoral college analyses. In the only instance where a state has been polled by Rasmussen more than once since the switch, the results cancelled each other out. The first poll gave McCain a one point edge with leaners while the poll that followed two weeks later saw Obama with the same advantage. Such a result likely won't be the norm, however. In Ohio, for example, using one version or the other shifted the Buckeye state's 20 electoral votes from Obama to McCain and back again. And though that is the only case of a change thus far, that list is likely to grow in the future when new polling data is released. 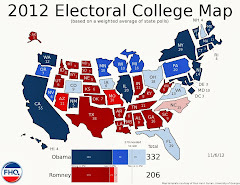 So looking at the map, we see that using the without leaners data -- the type that was used prior to July 9 -- shifts the map in Obama's direction with the electoral vote tally reverting to the 298-240 margin that had been in place for most of July until the new Ohio poll surfaced last week. That four point change in Ohio triggered just a 0.34 point change in our weighted average, but that is all that is necessary to move 20 vital electoral votes from one candidate's column to the other's. It could be said that all were arguing over is whether Ohio is a toss up favoring McCain or Obama when the real point is that the Buckeye state is a toss up. Period. It doesn't really favor anyone. That's a valid point. However, there are differences in other states -- obviously -- but one poll has not been enough to affect change in those cases. Further polling, though, may bring about that change. Note: I don't know how regularly I'm going to update these figures, but I have built them into my spreadsheet and I'm tracking the differences. When and if any changes occur -- major or minor -- I will bring them to the attention to our readers. Well, there's a lot to go over today. The latter half of the week saw a break from the 10 poll norm we had settled into over the course of the last few electoral college breakdowns with a typical amount of polling from Rasmussen (six new polls) in addition to another four swing state polling release from Quinnipiac. In total 17 new polls from 15 states were released since Wednesday. As I have mentioned in previous weeks, there seems to have been a relative settling down of FHQ's weighted averages while at the same time the polls have been fairly volatile (A state like Minnesota comes to mind. Results out of the North Star state have ranged anywhere from a 2 to 18 point lead for Obama recently.). And that pattern is continued with this new polling. One thing you will notice that is different about the New Polls table is that all the information from Rasmussen is included: both "with leaners" and "without leaners" results. And I should note that I'll continue to use the "with leaners" data to compile the information for our electoral college maps. Fret not, though. I plan on regularly updating the differences in those two numbers from Rasmussen and will chart those changes on a separate map as warranted. The map "with leaners" will continue to be the official FHQ electoral college map, though. As of now the only change from using either set of numbers continues to be Ohio. The map below (with leaners) shows the Buckeye state's 20 electoral votes going to McCain. When the leaners are excluded, Obama takes an equally narrow lead. That is the only case where a state's electoral votes change hands or categories. ...for now. Additional future polling could--and probably will--change that. All those polls and the only change is South Carolina moving more solidly toward McCain into the Arizona senator's lean category. The last time South Carolina shifted was following the Zogby poll that gave Obama a one point edge in the Palmetto state. As I said then, I didn't really think of South Carolina as or expect it to necessarily be an Obama state come early November. I said then, and I still maintain, that South Carolina is a state that Obama can improve upon past Democratic nominee's performances, but to win it would be a tremendous coup, not to mention an indication that Obama has won a landslide victory. Even when the Zogby poll is omitted, South Carolina remains a McCain lean. This is due in large part to the fact that this most recent Research 2000 poll in the Palmetto state is the only one to place the race outside of the single digit range. This poll, then, acts to pull the average here back into the range where we would expect South Carolina to be. Let's talk about landslides for a minute. An Obama victory that includes South Carolina may be considered a landslide but that characterization may be an exaggeration depending upon how landslide is defined. If you rank the states for each candidate (1 through 51) based on the states' current averages South Carolina would rank 34 on Obama's list. On the current map McCain has 26 states and 260 electoral votes while Obama holds leads in 24 states (and the District of Columbia) totalling 278 electoral votes. If South Carolina is the last state on the list that Obama is able to pick off from McCain (and assuming the Illinois senator wins the states between South Carolina and where his list of states ends), he would gain 101 electoral votes (That's a group of states that includes all thoes above shaded in pink and Alaska.) on the total in the map above. His advantage over McCain in that scenario would be 379-159, a margin comparable to Bill Clinton's 1992 electoral college win over the first president Bush (370-168). Was 1992 a landslide? Maybe. Maybe not. Compared to both Reagan blowouts or Nixon's thrashing of Mondale in 1972, that doesn't look so bad. But compared to the tight margins of the 2000 and 2004, it could be portrayed as such in November by the media. Is such a scenario likely? No, but I suppose it is possible. The reality of the situation now is that this appears to be a pretty close election given the current state of the polls and where most handicappers have things pegged currently (Though this appears to be up for debate. See the discussion between Abramowitz, Mann and Sabato and Campbell.). Obama has a lead, but not an insurmountable one. By our calculations, that margin is but 18 electoral votes, 278-260. During the latter half of this past week, McCain shifted South Carolina's 8 electoral votes into his lean category. And while that brings the Arizona senator total between strong and lean states to 157, that number still falls shy of Obama's stong total of 175. It should be noted, however, that the Obama's lean and toss up electoral vote totals are both currently hovering around 50. The Illinois senator has a solid coalition of states put together, but there still may be work to do putting together a winning combination. 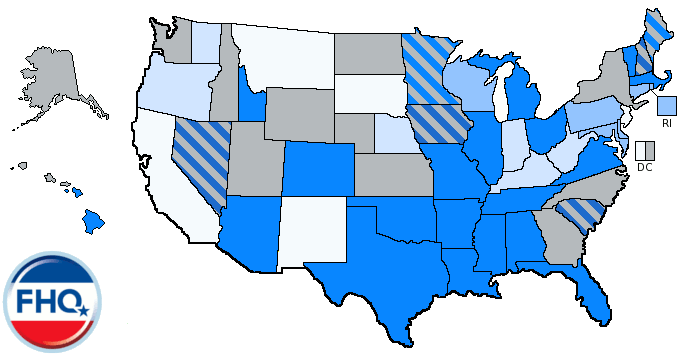 All of those (both light blue and blue) states are state where McCain is challenging Obama. And the Watch List? Well, North Dakota, South Carolina and Wisconsin have exited. The first is firmly within the toss up category, but favors McCain enough that new (and negative to McCain) polling won't necessarily move North Dakota into Obama territory. South Carolina, after a brief stay in the toss up category, is now firmly within the McCain lean area. And Wisconsin edges above the cut off point, but solidly within the Obama lean category. New Mexico is the only addition to the list. The Land of Enchantment's weighted average has been around 6 points (similar to Wisconsin) for a while now. Recently, it has been just above six, but with the new poll (Rasmussen +6) comes in just under that line. And that puts it on the watch. Essentially, Wisconsin and New Mexico switched places. I'll be back later today with an updated look at the recent Rasmussen numbers and some other stuff too. There's actually quite a bit of Guam news this morning. Well, any bit of news from Guam is usually quite a bit of news. But I'm one to talk: I've featured the island in at least three posts this election cycle. Anyway, Ballot Access News is reporting that the acting Guamanian governor (Lt. Gov. Michael W. Cruz) vetoed the bill that would have moved the island's straw vote for president from November to coincide with its primary election in September. Acting Governor Michael W. Cruz vetoed Bill No. 287 yesterday which would have moved Guam's "straw poll" vote for President and Vice-President of the United States from the general election to the primary election. "It seems conducting the "straw poll" hours before the rest of the United States begins voting would garner more attention than conducting a "straw poll" during the primary election," Acting Governor Cruz said. "If Guam is going to conduct a "straw poll" we should vote the same as all other American citizens which is during the general election." Although residents of Guam do not officially vote for these positions, Guam has been conducting what is called a "straw poll" casting of ballots for the President and Vice-President hours before the rest of the United States begins voting. That's interesting not only because of the veto news, but because it answers one of the questions that emerged from the post concerning bill #287 in the first place. Namely, when does Guam actually vote? On election day, which would be prior to the mainland US or after the rest of the US votes. Guamanians seem to take pride in being the first to vote. Hmmm, Guam as a bellwether. Interesting. Hey there! I saw this blog through a google search and I was deeply intrigued. To answer the questions posted on the comments, yes.. Guam does vote a straw poll during election day..... but... as Guam is a day ahead of the mainland US (hence the term, "Where America's Day Begins," we actually do this voting almost a whole day before the US Mainland does their General Election. I myself am privy to this fact as I, being a Liberal Democrat, was part of the 33% Guamanian minority who voted for Kerry in 2004. As I am currently on Hawaii, I plan on making this vote "count" for Obama (As if that matters in this solidly blue state... har har). This year we may see a break of this pattern though (i.e. the Guam straw poll being predictive of the US General Election results). Guam is a peculiar territory.... deeply rooted in Catholic beliefs. If anything, I would brand the electorate there EXTREMELY socially conservative (even the Democrats there are Pro-Life), yet EXTREMELY economically liberal (even the Republicans there support HUGE governement spending on social programs and hiring their close family friends to run them). Obama himself won the island by 7 votes..... and counting the super-delegates in the island, Hillary pulled ahead (you see, Hillary was a symbol to Guam voters as a "What can you do for ME" kinda politician). Obama, does not seem to play to this pandering as much as Hillary.... this may in turn hurt him in the Guam straw poll, but may very well help him in the US Mainland GE. Here's to a hope of broken PATTERNS!!! And so ends today's lesson on Guam. Any questions? Is Florida a Swing State? The clock is ticking on both presidential candidates to select running mates and there is even less for them than you might think. Sure the Democratic convention kicks off one month from today, leaving the candidates just over four weeks to make a selection. However, sixteen of those days will be devoted to the Olympic games and may not be the most opportune time to make such an announcement. With the games starting two weeks from today, both McCain and Obama will have to either fit their decisions into that two week window or make an announcement during the Olympic period. The consensus is that Obama will make the first move because the Democratic convention is first. McCain is at a disadvantage here because the GOP convention gets underway just a week after the Democrats' gathering in Denver. In other words he can't fall back on the time between conventions as a viable time in which to make his VP selection public. Viewed from this angle, reports of McCain potentially making his decision this week make that possibility seem less farfetched (going before Obama, perhaps would make it more unusual). So we have a predicted order of selections, and the timing has yet to be determined, but is severly constrained at this point. Let's talk about the Olympics as an obstacle to these decisions (And the games are not supposed to be political.) for a moment. During the last two cycles the Olympics had no real effect on vice presidential selection. In 2000, the Sydney games were not until mid-September, after both conventions and both VP selections. In 2004, Bush already had his man in Cheney and Kerry had countered that soon after he wrapped up the Democratic nomination by selecting John Edwards. But even though, the Olympics didn't play a role in the VP decisions in 2004 they may have had an effect on the presidential race. And I haven't seen this discussed anywhere. However, the Swift Boat Veterans for Truth released their controversial ad on August 5, 2004, just eight days prior to Athens games commencing. Now, that leaves three weeks, one before the games and two during, for that to percolate before Kerry could/would effectively respond (He did file a complaint with the FEC during the games.). Did those games stand in the way of an effective response though? And what does that mean for the VP selections to come? Well, the Olympics are a distraction and just enough of a distraction to allow for something underground like the Swift Boat ad to spread. However, something like a VP announcement would likely be viewed as a political move during an apolitical event. So while the Swift Boat Veterans may have been able to get away with it, McCain (or Obama) likely would not. It isn't that the games would overshadow the announcement so much that the announcement would be a move contrary to the overarching tenor of the games. If Obama is supposed to go first then, he may be playing a game of brinksmanship with McCain and his campaign now. To stretch the decision out this far either forces McCain to move first or decide at a bad time (during the games or the Democratic convention). Nate Silver covered this earlier in the week when the report of McCain's imminent announcment surfaced, but didn't include the Olympics angle. But McCain is up against it on this one. Obama is holding all the cards and, if he is the one to move first, could hold them until the eve of the games. The flipside, of course, is that Obama forces a move out of McCain but leaves himself little time to respond or respond effectively. As adept as the Obama campaign has seemed though, it would appear unlikely that they would be playing such a game of chicken without some contingency plans. There are only so many rabbits McCain can pull out of that VP hat. Thanks to Rob Shewfelt for getting the ball rolling on this one in the comments to the Florida post (linked below.). The Deal with Those Rasmussen "Leaners"
Polls below this point were conducted after Obama left to go abroad (7/19/08). Above that yellow line, Louisiana is the only state where the "with leaners" distinction favored Obama. But since Obama started his trip overseas, and incidentally this is where the coincidence potentially comes in, four of the seven polls to be released show Obama with the edge when leaners are included. Does this mean that leaners are starting to break for Obama? And, further, does the trip have anything to do with it? Are leaners breaking toward Obama? It certainly looks that way. Are these simply Obama states in the first place, though? With the exception of Florida, all seven states are states that are Obama states in FHQ's most recent look at the electoral college (Well, Ohio changes sides depending on whether you use Rasmussen's leaners or without leaners data.). But that wasn't the case in the polls taken before Obama left. Of the 12 states where there was a difference between the with leaners and without leaners numbers, six were Obama states and all six saw drops in the margin when leaners were added. The other eight states, where there was no difference in the margins once leaners were added, were equal parts McCain and Obama states and all broke in McCain's direction. It seems then, that it isn't just a matter of the states polled since Obama left being Obama states. Fine, just more than half of the seven states where polls have been conducted since Obama left have leaners favoring him now (Well, that does quintuple the number of states that were in that category in the first place.). That is a switch, but does that mean that the trip is what triggered the change? Maybe, maybe not. Rasmussen's own daily tracking poll does have Obama bouncing. And the "with leaners" numbers at least appear to show Obama gaining among that group in states where respondents have been surveyed since Obama left at the outset of last weekend. Coincidence it may be, but it is an interesting way of going about assessing whether Obama has gained anything out of this trip. If this is evidence--and even I'm skeptical of that--of Obama getting a boost from this overseas tour, then it is among the group in the middle that is likely to decide this election. Did Obama Bounce Everywhere in June?